Elenore Plaisted was born in Lincoln, Maine. She married C. Yarnell Abbott and lived for a time in Rose Valley, Moylan, Pennsylvania. She studied at the Pennsylvania Academy of the Fine Arts, the Philadelphia School of Design for Women, and in Paris before entering the Drexel Institute, where she studied with Howard Pyle in 1899. 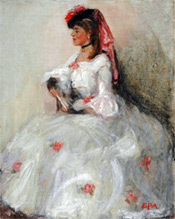 Abbott exhibited her work at the Académie des Beaux Arts in Paris and the Pennsylvania Academy of the Fine Arts. She was a member of the Philadelphia Water Color Club, and the Plastic Club of Philadelphia. I'd like to mention only the work I was glad to have done... under Mr. Pyle I did drawings, paintings for illustration for poems for Saturday Evening Post, Harper's Magazine and Scribner's and one of the illustrations for a book of Houghton Mifflin that was given to the clan to illustrate. Mine was "The Minister in the Black Veil." I did a book for Lippincott and George W. Jacobs. All very youthful works and not at all good. My later work has been illustrating Keat's poems, which have found no publisher as yet, though they are my best work, and doing color illustrations for Scribner's Magazine. The best of which is "The Mother" and was published in the Christmas number, 1916, I think. Scribner's is bringing out a book of my pictures for Grimms Fairy Tales this Christmas in the same set that Wyeth and Parrish have made famous. I had an illustration for a story of Maxwell Struthers Burt in the last Christmas Scribner's in black and white, an illustration for a story called "Kerfol" by Edith Wharton and one by Ellen Glasgow called "The Shadowy Third" the year before the war - 1916 - all in Scribner's. At last she has a theme she can simplify or embroider to her heart's content. Elenore Abbott loves her fairy tales as one who never grew up, and no child who receives such a book will be disappointed... Elenore Abbott is not a surface clever Artist; her active, vigorous yet idealist's mind is brought into subjection and guides the long sensitive fingers that hold the water color brush. References: Bénézit; Fielding; Young; Art Annual 26, 1919; International Studio 67, 1919; DAM files.